Admittedly, this post is very late. But better late than never right? 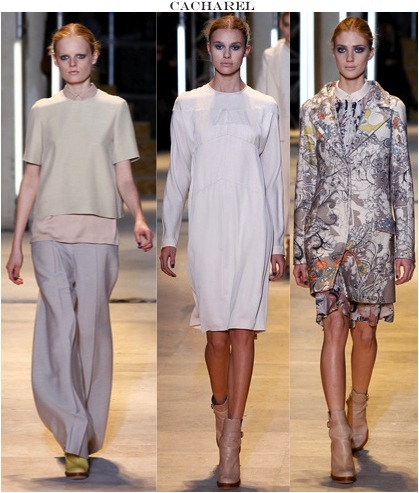 These beautiful clothes still need to be shown even though Paris Fashion Week ended a few weeks ago. They are beginning to slowly trickle in to magazine’s fashion closets. Editors are using their best sweet talk to persuade PR companies to let them have these pieces first and assistants are dueling over who gets to feature the Louis Vuitton French maid outfits before the rest. 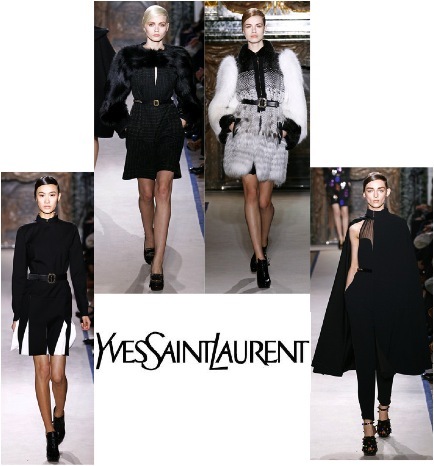 So below is the rest of the best if Paris Fashion Week. It’s pretty crazy that there is only a bit more than five more months until it starts all over. 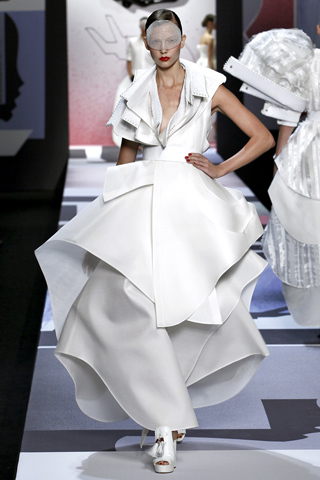 Oh, Lanvin and Alber Elbaz, how I love you so. 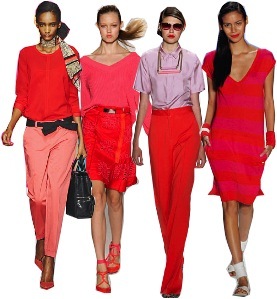 This season was a but subtler than the past but his gorgeous pinks and oranges rule the runway once again. Now who do I contact for one of those amazing “Why yes I am a celebrity” hats? The show in general was a bit kitschy for me but the huge pailette skirts and dresses are really amazing and made it all worth while. 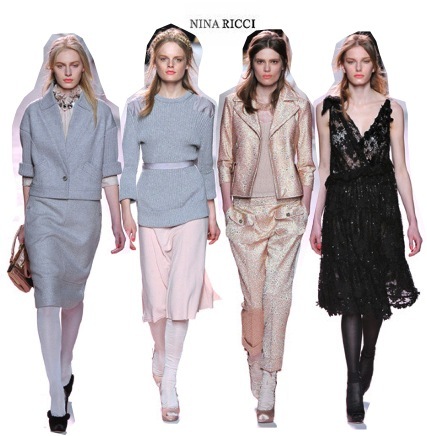 Nina Ricci is consistently one of my favorites, season after season. The ultra femininity without looking at all childlike or weak is very impressive. 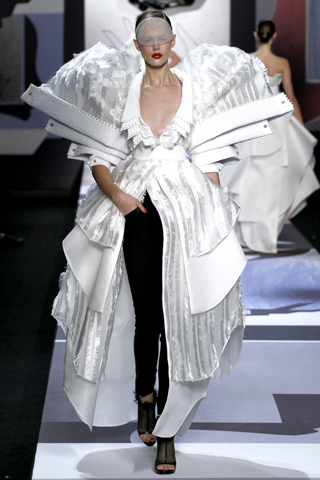 Peter Copping is a design genius in my mind and is right up there with Mr. Elbaz in terms of women’s clothing. The soft baby blue-gray color is too pretty, I want to dye all of my clothes that color. 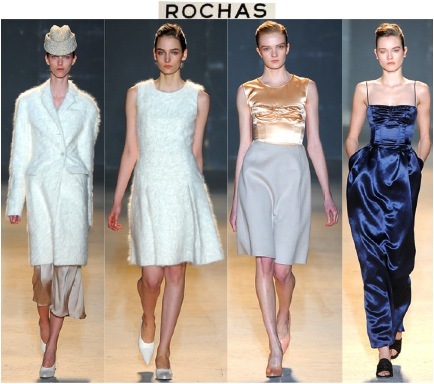 Rochas designer Marco Zanini has this innate ability to take very vintage, retro shapes and fabrics and make them overtly modern and luxurious. Who wouldn’t want that snow white furry dress for a blisteringly cold December day? Stella loves her spots. 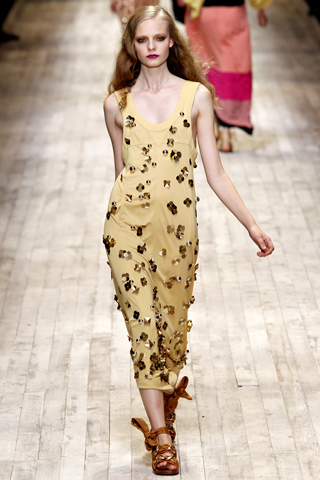 The Fall trend of polka dots is absolutely solidified with the Stella McCartney collection. 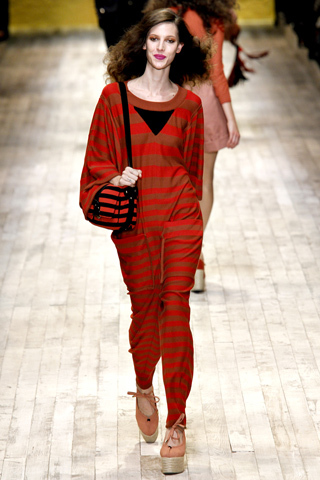 The designs are actually very wearable, even the see-through spotted jumpsuit. I wouldn’t consider Valentino one of my favorite designers, but I thought the collection above is the best I have ever seen from the house and I would give a kidney (you only need one right?) to own the 6 looks above. 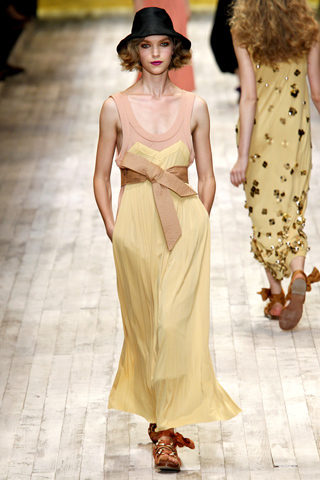 The designers at Valentino made a leather dress sweet and completely sin-free. Impressive, no? Fur and capes. Enough said. 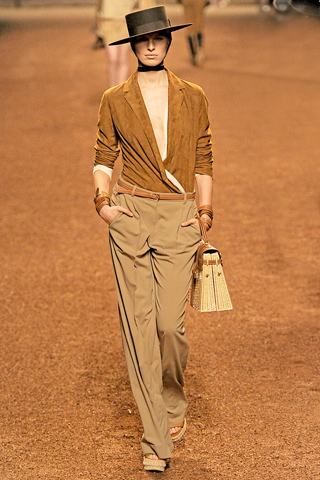 Paris is absolutely my favorite of the Fashion Weeks. There is just something about the city that makes the clothes more magical, more beautiful, more aspirational even. 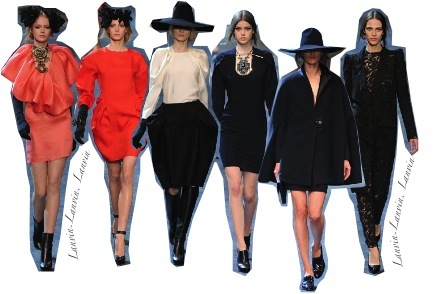 Below I have edited down some of my favorite collections of the Fall 2011 season. The rest will be posted shortly. 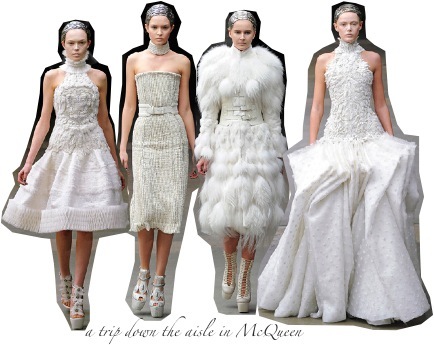 For now please enjoy A-C.
Sarah Burton’s second collection for Alexander McQueen boasted some stunning gowns, fit for a Queen (hint Ms. Middleton). The fairly small collection was almost exclusively black and white, very Victorian and full of luxurious fur and structure. Head designer of Balmain, Christophe Decarnin, has regretfully checked himself into a hospital due to depression, and did not work a lot on the line this season, but despite that the old world house pulled through and created a luxe tomboy ish line. I appreciated the departure from the safety pins and ripped tees, the sequin dresses and metallic fabrics are so fabulous. Cacharel’s show was interesting, half was the beautiful flower design and the other half was the very simple neutral colored separates, both were equally wearable and modern. 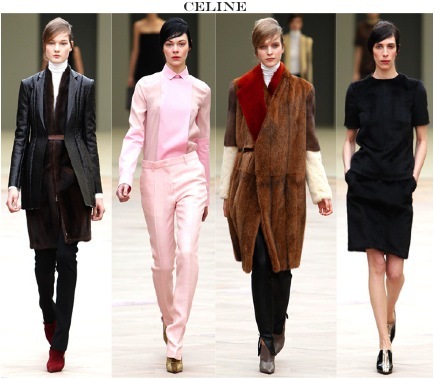 Admittedly the Celine show this season was not as great as it was in the past, but the four looks above I found to be the exception. Fur is clearly not going anywhere (yay!) and for some reason I cannot get that pink suit out of my head. Hannah MacGibbon didn’t get the best review of this season’s Chloe collection, there was too much snakeskin and not enough of her beautiful 70’s camel pieces that made the line so popular again. 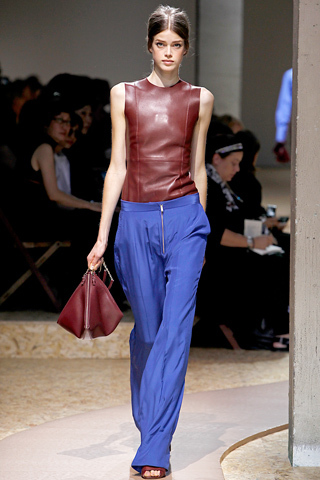 However, I really loved the leather pants and these new colors she is introducing for Fall. Seeing that I am not a “tomboy” in the least (though you should have seen me in the 90’s) I wasn’t a huge fan of Chanel and all of the skirts over pants and boyish clothing. 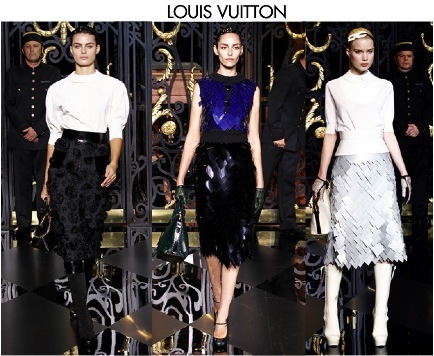 It was mainly black and dark colors, and I feel like only models can pull off the skirt/dress over pants look. 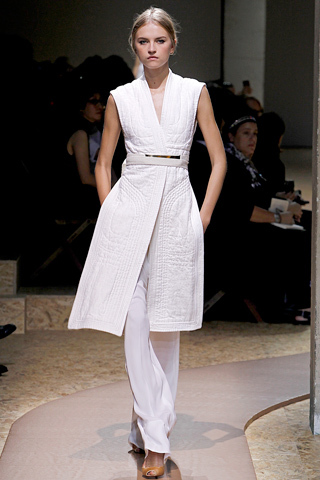 But I did love some of the chiffon dresses and black jumpsuits, it is Chanel after all. Has St. Valentine Inspired our Designers? 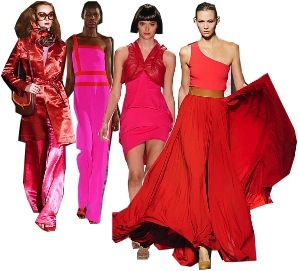 Everywhere on the runway, from New York to Milan, from Lacoste to Project Runway contestants, featured red and pink together in the collections. 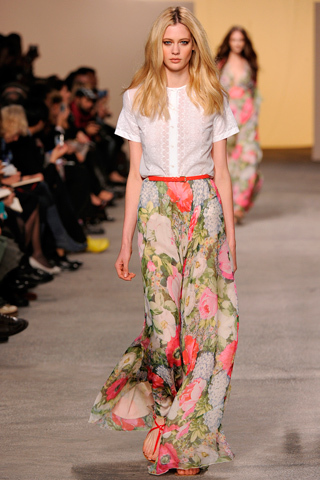 This color combination used to be reserved for Valentines Day and wedding bouquets, but apparently it is okay, no, down right fashionable to wear it for Spring 2011. I’ll be honest, I never would have worn these colors together, for fear of looking like a paper heart or a lipstick ad. But now I am intrigued. I suddenly have this desire to go out and buy a bubblegum pink American Apparel leotard and wear it with a long red skirt (I would settle for high waisted pants). 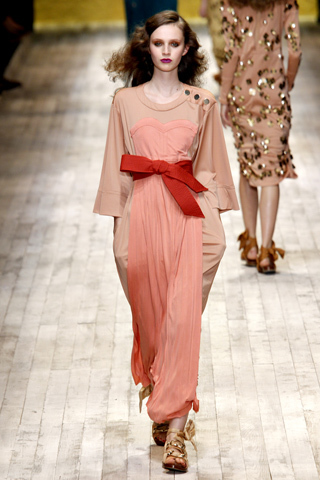 The combination seems so daring, yet at the same time innately girly and romantic. Here is how the designers showed the colors. How will you? Because I am quite far behind on my fashion shows I have decided to condense the last few days into one final post. That means that these are the absolute stand out pieces from the final days of PFW. There should also be a moment of silence for both Jean Paul Gaultier’s last Hermes collection and Sarah Burton’s first collection for Alexander McQueen. Let the changing of the guards commence. 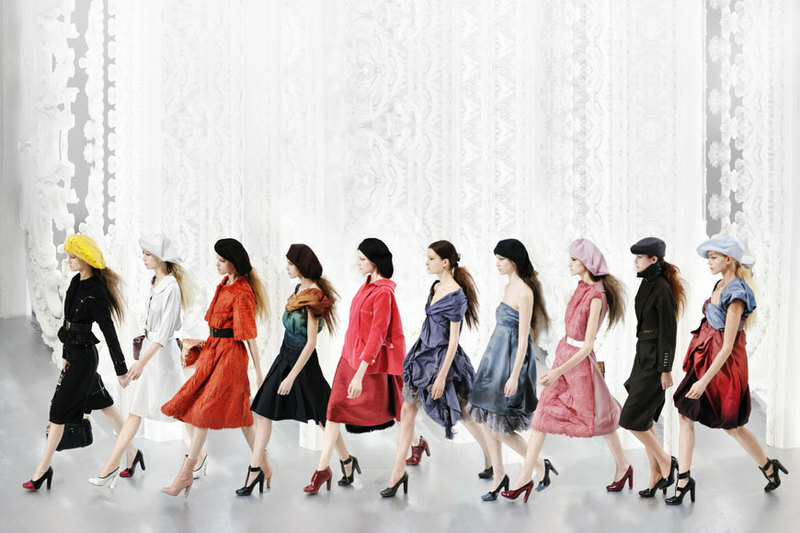 This is kind of like the Tipping Point in Paris Fashion Week. The days following Day 5 are the heavy hitters fashion wise. Today is John Galliano, Celine, and Givenchy, and the next three days are when the biggest and oldest fashion houses show their collections. 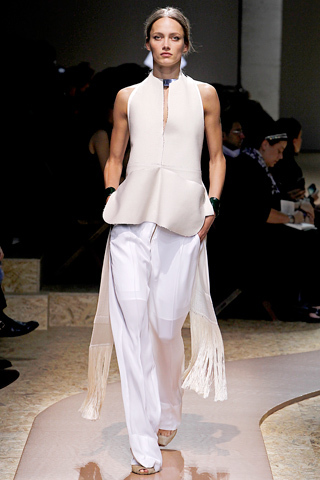 As almost everyone knows, Celine is up there with Lanvin to me. 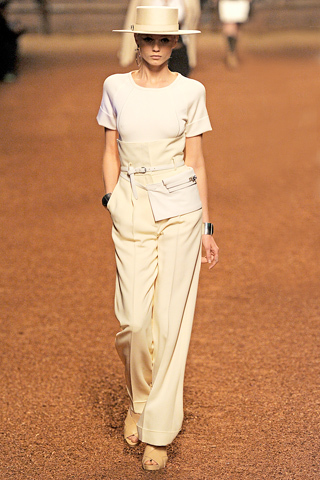 Fashion doesn’t get any cleaner or minimalist chic than Celine. 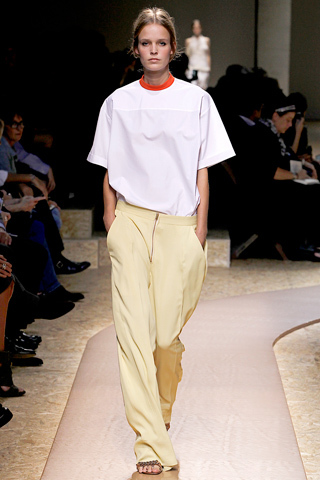 Phoebe Philo is a descendent of the fashion gods in my eyes, and her last collection was so inspiring and beautiful, that if it wasn’t so pathetic I would have cried and every night until I owned the complete collection. This season was still lovely, perfectly summery and Parisian in my eyes, but I don’t know if anything can top that last collection. 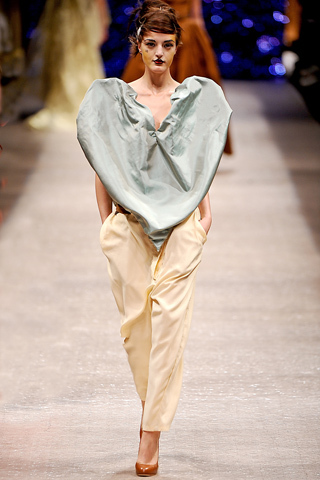 John Galliano, like Jean Paul Gaultier, creates amazingly fun fashion shows, with unrealistic clothing that could hardy ever be worn in public. But his last few evening gowns were to die for. Their sheerness was on the verge of unwearable but he walks the line so well no one cares and I would wear them every day if I could. 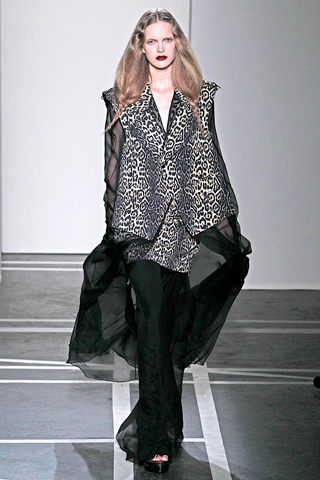 The Givenchy couture collection shown this summer was the best Givenchy collection I have seen. To me, this one fell short of the extravagance and beauty of the last show but there were still some pieces which would look amazing in my closet. 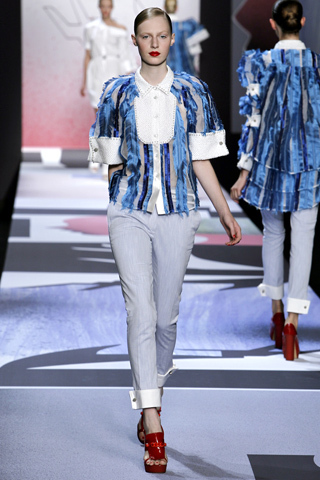 Day 4 PFW is all about the quirkiness factor. The designers who showed their Spring collections Saturday morning are known for extravagance and personal style. 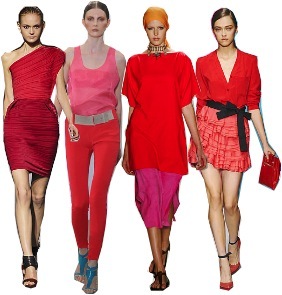 (Except for Cacharel which is Parisian simplicity in a brightly colored nutshell). There were surprises in store for us. With designers like Jean Paul Gaultier and Viktor & Rolf, it is basically a given, but I don’t think anyone expected plus plus size singer Beth Ditto opening the JPG show. But she did, and also in the show were two other plus size models, Crystal Renn and Marquita Pring. 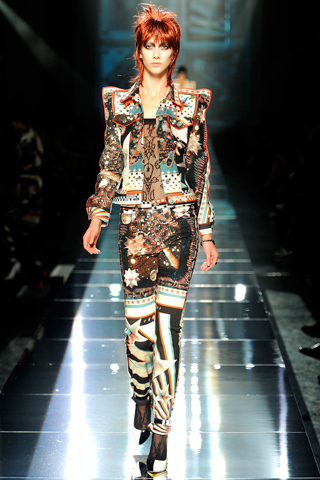 Gaultier’s eccentric designs don’t really translate to me, but the craftsmanship and layering is quite impressive. 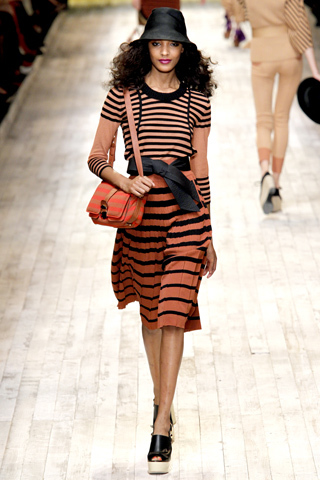 Cacharel and Sonia Rykiel are classic French designers, they both love bright pinks and oranges, colors which scream spring/summer and they take simple designs and make them fascinating. Loewe, a predominantly leather goods company, has had a new British Creative Director, Stuart Vevers, since 2008 and I am absolutely in love with his new designs. The clothing that I was drawn to the most was made of leather, which makes sense because of the company’s history. 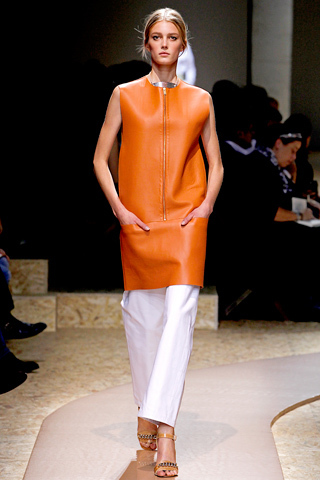 He took simple pencil skirts and shift dresses and made them so luxurious by doing them in a soft leather or suede. 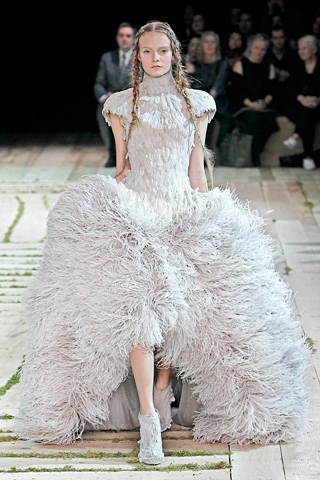 And then there is Viktor & Rolf. 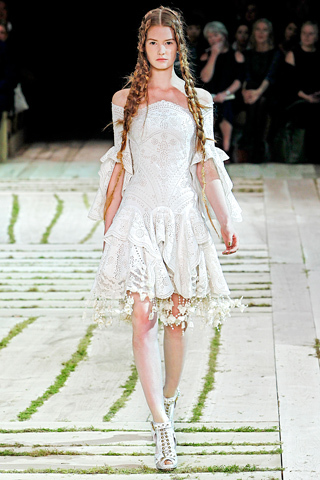 They are the masters of twisting and deforming clothing, but still making it beautiful. One of their signature moves is to add more collars or cuffs than necessary, and it was definitely not left out of this collection. The white (wedding?) 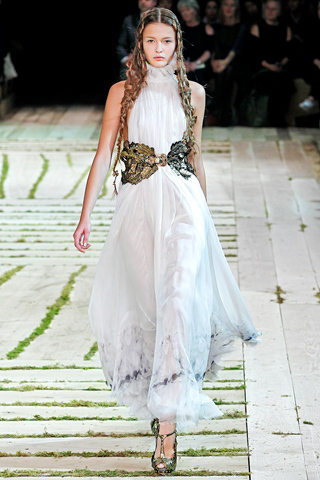 dresses at the end were actually quite beautiful and not so avant garde that they couldn’t be worn. 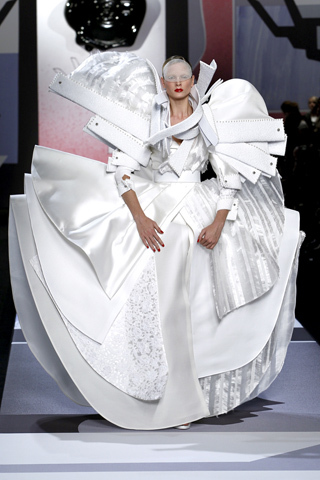 Over all I am more a fan of Cacharel, Loewe, and Sonia Rykiel for their amazing colors and simpler designs, but fashion would be so boring without Mr. Gaultier and Viktor & Rolf. 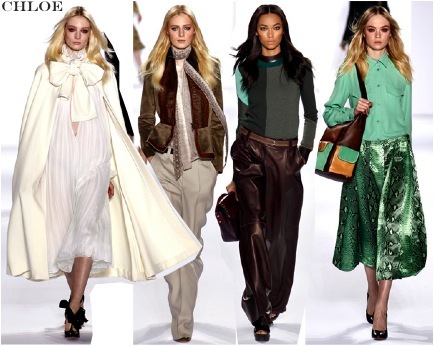 Now we are up to October 1, PFW Day 3. 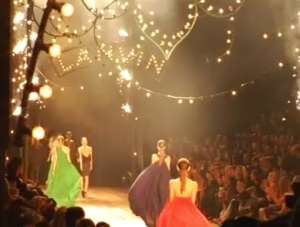 Yes this was the day that the ever talented Alber Elbaz sent his Lanvin collection down the runway. It should really be a national holiday, a day dedicated to the most beautiful clothes. Lanvin Lover’s day? It has a nice ring to it. 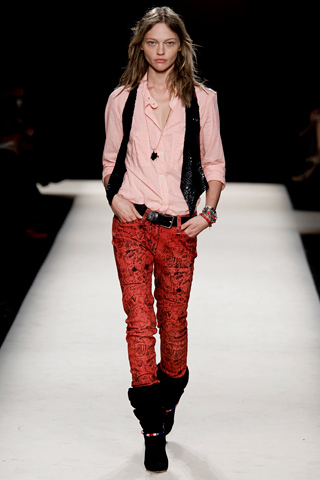 I love clothes which means that I love a lot of designers. However, I find that there are two or three that I know I will love every collection they put out. And Alber Elbaz is at the top of that list. 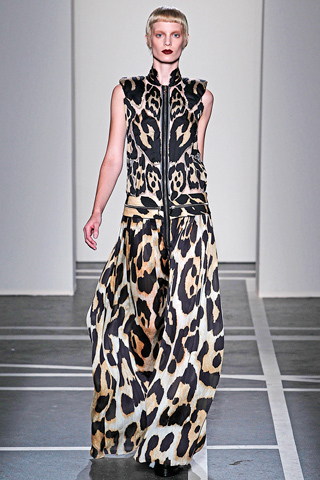 His collection on Friday was absolutely gorgeous, dare I say, better than last seasons? 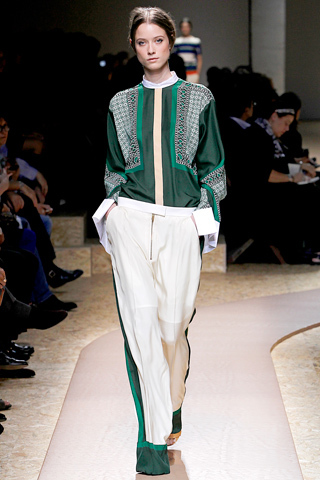 The colors from poppy to the pale mint green were almost as stunning as the draping and movement of the clothes. 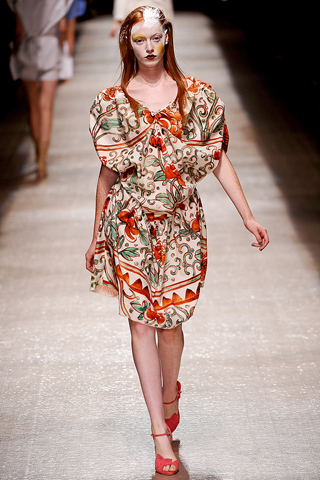 If there is one thing Elbaz does best it is making women look incredible in his designs through the use of drapery. 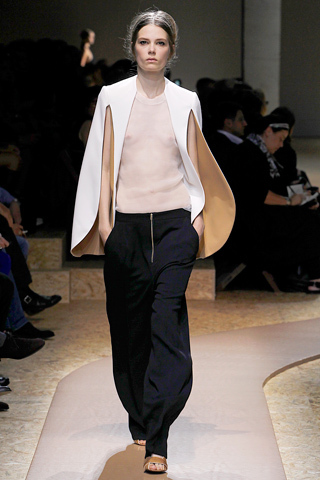 The Christian Dior collection on the other hand was not nearly as good as last seasons. 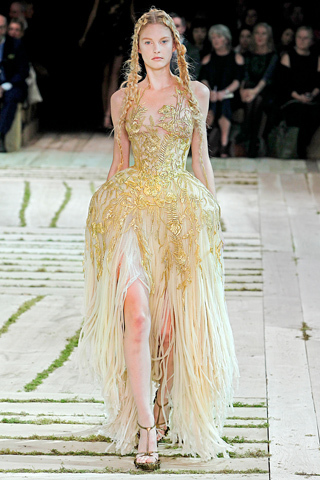 John Galliano is one of the best, however, I do not always admire his design aesthetic and taste level. His couture show in the summer inspired by flowers included some of the prettiest dresses I have ever seen, and the collection in the spring with the Victorian twist was gorgeous. But I really did not like his collection this fall except for the finale evening gowns, which in my opinion are his strong suit. 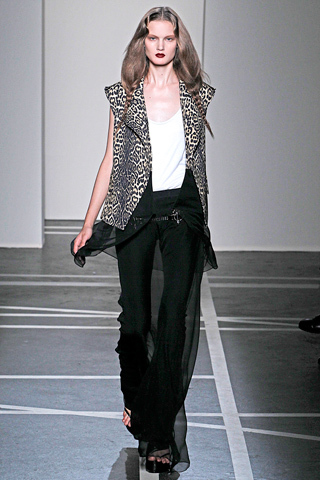 Isabel Marant is the cool girl. There is no way around it. Her clothes are always put together in a way that you wouldn’t think makes sense but somehow it does. Her sweaters this collection look so cozy I just want to run down to SoHo and buy all of them. 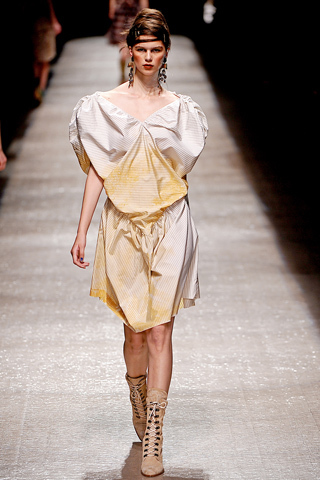 Vivienne Westwood knows how to make people talk. Her clothing is never shy or polite, and this season is no different. I can’t wait to see some model or celebrity try to pull of the heart blouses, and the first who does should really receive a round of applause.